If your project or contract is based on a set number of milestones and circumstances arise that change the milestones, you may need to waive one or more milestones. To avoid any contractual problems, use the Milestone Waiver Agreement as an addendum to your contract to waive the requirements of one or more milestones. This Milestone Waiver Agreement is included in editable Word format that can be customized in Word or by using the included Wizard software. How do you write a Milestone Waiver Agreement document? Company Name agrees to waive the following milestone(s) and deliveribles and release Company Name from any further contractual obligation. Initials Description of Waived Milestone(s) Description of Project Milestone Deliverable(s) to be waived - Milestone number here: rights and remedies and any information pertaining to alteration of payments concerning this milestone or deliverables. I certify that the aforementioned milestones and/or deliverables required under the agreement # listed on this document have hereby been waived and I release Company Name from any requirement to demonstrate, deliver, or otherwise complete to my satisfaction in order to fulfill the terms and conditions in aforementioned agreement #. 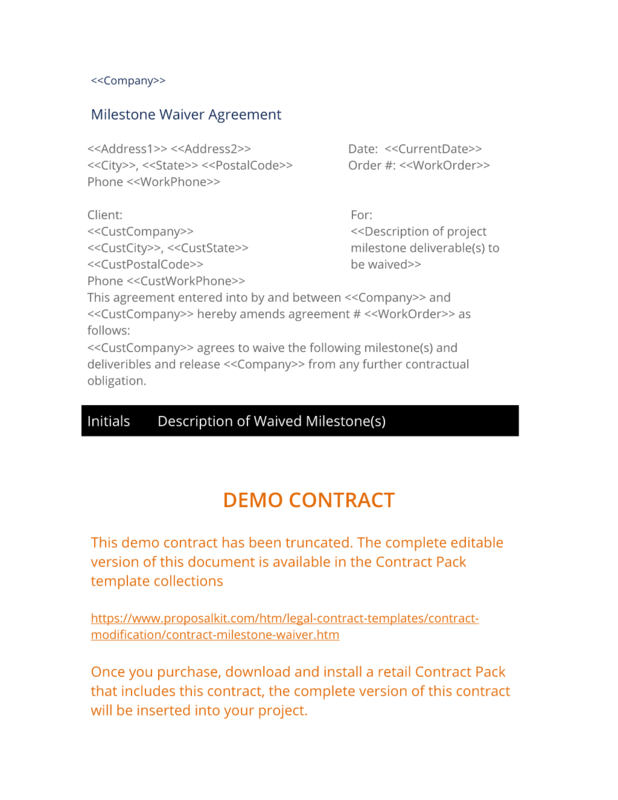 The complete Milestone Waiver Agreement - with the actual formatting and layout - is available in this Contract Pack.